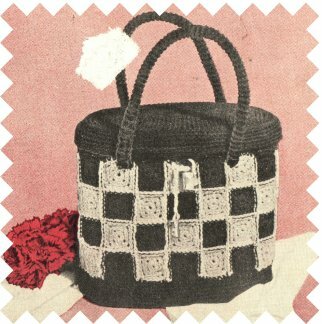 You'll find this easy granny square crochet purse pattern both practical and pretty. It is quickly and easily crocheted in any two desired colors. This could be one of many fun beginners crochet projects for teaching crochet. 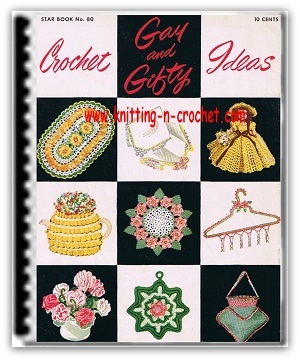 It is also a great idea for gifts filled with all sorts of items. The example was made from four balls of black Coats & Clark O.N.T. "SPEED-CRO-SHEEN" Mercerized Cotton and one ball red. Use a number 0 steel crochet hook. You will also need 1/4 yard each of black buckram and red felt, a small pad-lock with key and a piece of heavy cardboard. 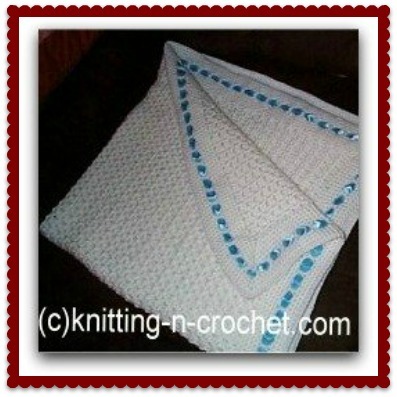 Gauge: Each motif measures approximately 11/4-inches square. Easy granny square (Make 32 each of red and black) — Starting at center, ch 2. Rnd 1: 8 sc in second ch from hook, join with sl st to first sc. Here after work in back loop only. Rnd 2: Sc in first sc, 3 sc in next sc, (sc in next sc, 3 sc in next sc) 3 times, join. Rnd 3: Sc in each sc around, making 3 sc in center sc at each corner. Join and fasten off. To Join Squares: Place the wrong sides of black and red squares together. With red square facing and working through both thicknesses, join red to back 1p of center sc at corner, sl st in back 1p of each sc across to center sc at next corner. Then, reversing colors of next 2 easy granny squares, sl st in back 1p of center sc at corner and in each sc across to center sc at next corner. Continue in this manner, reversing colors until 32 squares (16 sets) have been joined. Fasten off. Join 2 more rows of 16 squares to previous squares the same way, alternating colors to form a checkerboard design. Working across short side, join free sides of squares the same way. Join last row to first row. Border—Rnd 1: Join black to back 1p of sc following corner sc on any square and, * working in back 1p only, sc in each sc across to within next corner sc, (insert hook in next sc and draw 1p through) twice, thread over and draw through all 1ps on hook (joint sc made). Repeat from * around, join. Rnds 2 through 6: Work in both 1ps, sc in each sc around, join. Fasten off at end of 6th rnd. Work border on other side the same way. Bottom —Starting at center with black, ch 25. Rnd 1: 3 sc in second ch from hook, sc in each ch across, 3 sc in last ch, working along opposite side of starting ch, make sc in each ch across, join. Rnd 2: Sc in each sc, inc 3 sc evenly on rounded ends—(to inc 1 sc, make 2 sc in 1 sc), join. Repeat rnd 2 until piece is large enough to fit bottom of bag. Fasten off. Pin bottom in place and, working through both thicknesses with black, sc closely around. Join and fasten off. Top—Work exactly as for bottom, do not fasten off. Next rnd: Sc in back 1p of each sc around, join. Following rnd: Working in both 1ps, sc in each sc around, join. Repeat last rnd 3 more times. Sl st in each sc around. Join and fasten off. top and bottom of bag. Insert card-boards and line bag and top with buckram and felt. Place top on bag and sew across 4 inches to form a a hinge at back. Handle (Make 2)—With black, ch 2. Rnd 1: 6 sc in second ch from hook. Circles of flowers and wheels are joined to make a doily that is approximately 18 inches in diameter. The model was made from size 20 mercerized crochet thread and a number 8 steel crochet hook. Loops—Mark off 6 sts at center of top. Join black to first st, ch 6, sl st in next marked st, turn. Sl st in each ch across, fasten off. With red make a loop on bag to correspond. Join red to red loop and make a chain 2 inches long. Fasten off. Sew key securely to end of chain. Fasten bag -with padlock. If desired, a mirror may be glued inside cover of bag.